Mizuhiki indicates the material itself as a paper cord, and also indicates the ornament or the work that is made of mizuhiki paper cords. Nowadays, the most opportunity to encounter the mizuhiki ornament is at the reception desk of wedding reception, where the invited guest hands over the shugi-bukuro (money envelope) decorated with Mizuhiki ornament to a receptionist. 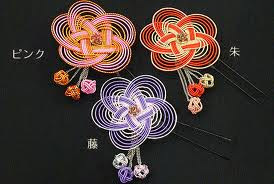 The custom that binds a gift with colored cords and defines the significance of its shape is a traditional culture of Japan that has been lasting 1400 years, and it is said that its custom had come from China originally. But to have applied WASHI Japanese paper as a material of the Mizuhiki cord and to have defined the complex rules of Mizuhiki ornament to suit to old regulations that Samurai and Aristocratic society of those days obeyed, must be Japanese original ideas, which was able to express an intention of the sender more in detail. Mizuhiki is made of strong washi paper which is cut into long strips and twisted into strings. Because it is covered with glue made of seaweed and white clay to stiffen it, the Mizuhiki has enough strength and moderate elasticity, that make it possible to make a three-dimensional ornament easily and to maintain its shape for a long time. As mentioned before, because the culture of Mizuhiki which includes the rules of gift giving is one that reflect the social system of old times. 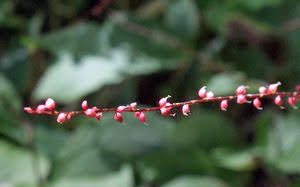 Nowadays, it seemed that the frequency of using Mizuhiki as a traditional practice is on the decrease. 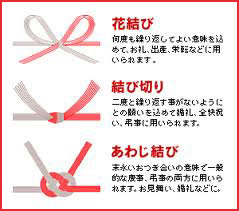 But, because its physical character is effective even now, the application of mizuhiki paper cords, such as materials of handicraft or the alternative ribbon of gift wrapping, is expanding. Traditional Japanese mascots or seasonal flowers, made of mizuhiki are decorated on a Shikishi-board that is square thick Japanese paper. Some Shikishi-board are framed and others are not framed.
. Presentation Envelopes - Shuugibukuro　祝儀袋 . Mizuhiki, a lovely decoration craft that connects the hearts of the presenter and receiver, has been handed down through the ages as a tradition of elegance and has become deep-rooted in the lifestyle of the Japanese. Approximately 70 percent of all traditional-style of money envelopes with mizuhiki decoration. These traditional envelopes are used to give money as gifts for various occasions such as to congratulate or show condolence, to give on recovery from illness or as a farewell gift and are used as an integral part of daily life in Japan produced in Ehime. This makes Ehime one of the leading producers of mizuhiki along with Iida region in Nagano Prefecture. Apart from being used for decorating money envelopes, mizuhiki is also used in art crafts and deluxe betrothal gifts, and is increasing in quality and variety year by year. Kaga mizuhiki uses gold leaf and silver leaf abundantly, and it is knitted skillfully into shapes of pine, bamboo, and plum trees, cranes, or tortoises that are considered as bringers of good luck. Kaga mizuhiki is indispensable to auspicious occasions, such as ceremonial exchanges of betrothal gifts. A traditional craft of the regions of Iida and Shimo Ina 下伊那, where strong washi paper has been made since olden times. A traditional craft of the Iida area, Mizuhiki is made from strips of Japanese “washi” paper twisted into strings and stiffened with a seaweed and clay compound. 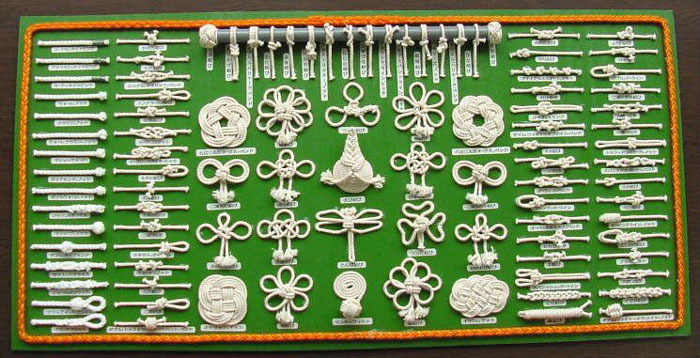 Combined with colored silk, it is typically tied into a decorative knot and attached to gifts in times of congratulations, condolences or weddings, symbolically tying together the hearts of the giver and receiver. Mizuhiki making techniques in Iida have been passed down from generation to generation and the area now produces 70% of all Mizuhiki made in Japan. There are several workshops in Iida where the Mizuhiki-making can be seen. Kouchi Festival takes place at Koza, Kushimoto-cho, Wakayama prefecture on July 24th and 25th each year. It is also known as “Mifune-matsuri”, or Boating Festival, and is held on the banks of the Koza River 古座川. The festival is designated as an important intangible folklore cultural asset by the Japanese government. The festival dates back to the Gempei War in 12th century when the naval forces of Kumano who fought for Genji Clan celebrated their victory at Kouchi Shrine. The festival replicates the triumphal return of the military force. 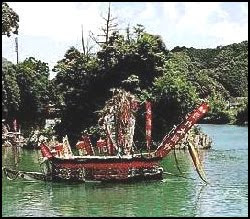 Three boats decorated with vividly colored battle cloth, mizuhiki paper strings, spears, halberds and lanterns enter the river after the opening ceremony at the Koza Shrine and slowly move up to Seisho Island where Kouchi Daimyoujin, the local deity, is enshrined. The boat takes two days to reach the island and therefore all prayers and offerings take place on the 25th. Shishi lion dances are demonstrated in the town and an exciting boat race called “Kaitenma Kyoosoo” is undertaken by junior high school students further enchanting the crowd.
. WASHOKU - Sushi . The Mizuhiki is a rectangular cloth of rich brocade, which covers the front and sides of the altar table. The Uchishiki is a triangular piece of cloth, which hangs over the front of the altar table over the Mizuhiki. The cloth is also of rich brocade using gold and silver thread.
. Buddhist Altar Cloth (uchishiki　打敷） .
. Mizuhiki Fudo 水引不動 to bring rain .
. mizuhiki no hana 水引の花 Antenoron flower . tonbo musubi とんぼ結び / 蜻蛉結び "dragonfly knot"
A knot is a method of fastening or securing linear material such as rope by tying or interweaving.
. utabukuro 歌袋 song-pouch, bag to keep poetry . Gabi-san.... thank you for the great pictures of the string art, sushi, and leaf art. The Japanese truly make art a daily activity.